Ask fellow campers about "Louisville State Recreation Area" and nearby attractions. Very friendly service. Great shade. We camped at Louisville State Recreation Area in a Travel Trailer. For the unreserved spots - best to put a camper in place wed or thurs before a busy weekend otherwise have to make sure you have a reserved spot. Fantastic place to camp! We were not impressed. Trains were about 20 minutes apart with horns blasting day and night! This was right on the other side of the lake, some of the tent sites were mere feet from the tracks. Good luck sleeping. The bathrooms were nasty and had mold on the wall around the flush button. They smelled terrible. We ended up buying cans of air freshener to spray in there every time we went in. Plus it cost a quarter for each three minutes of showering. The $5 per night vehicle fee was not an issue for us as we had a annual sticker. We will not be returning. We camped at Louisville State Recreation Area in a Tent Trailer. Campsites are paved and have 30 amp service, no water. Some sites are harder to back into than others due to tight curves. Park office was closed when we arrived, but Ranger found us and informed us that, in addition to daily fee of $18 (plus $7 online admin fee), we needed to pay $5 daily usage fee. Restrooms were dingy, with dirty floors and mold growing on wall where water dripped from flusher. Based on that, we chose not to even check out the showers. Camp hosts not engaging. With such high camp fees, we were really disappointed with services and maintenance. There are many more places in the Omaha area - we would not stay here again. We camped at Louisville State Recreation Area in a Travel Trailer. LOUD trains-- constant-- so loud the ground shakes and during the day the boats on the Platte give competition so you have noise on both sides. No directions from the check in, we finally stopped at a camp host to find our where our site was. Check in person was more interested in making sure I paid the additional $5 per day for my vehicle pass. "Sure you don't want the annual pass for $25?" No, I'm staying 3 days. Oh by the way checkout is 2:00 but your vehicle pass is only good until noon. $20 + tax +$5 + noise - water = not coming again! 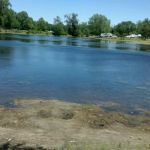 We camped at Louisville State Recreation Area in a Motorhome. Great Campground... Yes, you have to pay for a Nebraska State Park pass, at 20.00 or so, or 4.00 per night for a daily, however, it's way cheaper then other alternatives. Nice people, nice campers, great place to camp. We camped at Louisville State Recreation Area in a Fifth Wheel. This is a great place if you are camping with a family. It is somewhat noisy and at times can be congested with traffic. 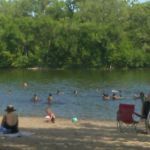 It is level for bike riding, has a nice beach area and easy access to the river if you prefer to swim there instead of the lake area. A snack shack is available and well stocked. 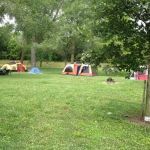 We camped at Louisville State Recreation Area in a Travel Trailer. Very nice campground with nice big pads, and shady, nice trails. The big drawback: trains. Non-stop, whistle-blowing trains every twenty minutes. We were here for 3 nights and couldn't wait to go home and get a peaceful night's rest. Really too bad. Won't go back again. 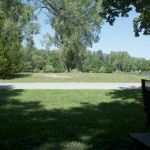 We camped at Louisville State Recreation Area in a Fifth Wheel. Game & Parks managed recreation area close to town. Nice spots and well maintained, however immediately next to the campground are railroad tracks where coal trains run non-stop day and night. No matter where you camp in this campground you will hear the trains and the very loud horns blasting long all night and if you camp in the spots closest to the rails you will feel the rumble as the trains go by. No kidding... these coal trains roar by about every 20 minutes day and night and are very, very loud. You would swear the engineers hold down on the horns almost non-stop as they pass the campground. Do not plan on sleeping. Unfortunately, were it not for the trains this would be a nice campground. We camped at Louisville State Recreation Area in a Travel Trailer. Pretty standard State Park camping... Electric only sites. Dump and Water fill is available. Several lakes to fish from. Located on North side of town. Next to very active train tracks, so expect to hear trains in the night frequently. Fairly nice spacey spots. You have a fire ring but no grill. Most sites are on a cement pad. We camped at Louisville State Recreation Area in a Fifth Wheel. Are you affiliated with Louisville State Recreation Area ?